Rebel Hangar Lounge open at Hollywood Studios for the Star Wars fans! 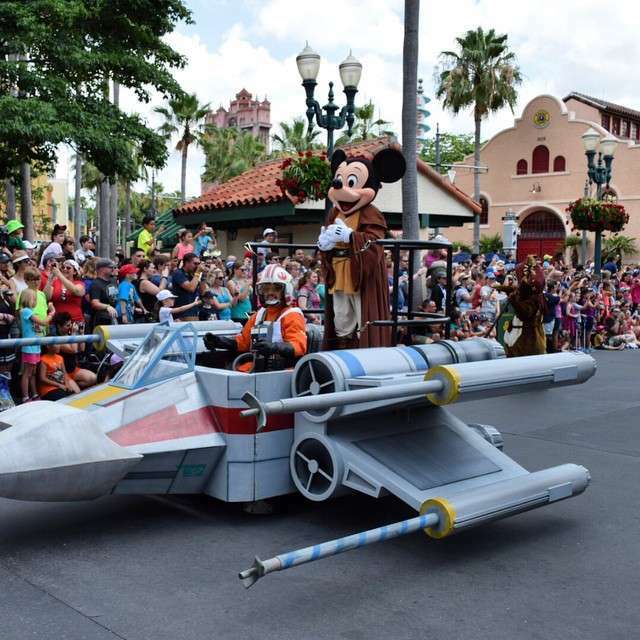 Disney Star Wars Weekends offers a new dining experience for all Star Wars Rebels fans, new and original. The Rebel Hangar Lounge is a great place to cool off, grab a bite to eat and a refreshing drink if you are looking to escape the summer heat that some would say rivals the desert of Tatooine. During my visit to the Rebel Hangar Lounge, I ate enough food to feed an entire fleet of X-wing pilots! The menu is filled with Star Wars inspired food items and drink choices. We choose to indulge in the Pilot’s Pommes Frites, The Slider Sampler: The Sith and The Jedi, and the Ilum Fruit and Cheese Sabers. The Pilot’s Pommes Frites are seasoned with fresh garlic and parmesan cheese sprinkled on top. It is served with a Chewbacca wanton crisp and garlic aioli dipping sauce. The Slider Sampler is two delicious bite sized Barbecue pulled pork and pulled chicken sliders, served with house made chips. Fresh fruit and cheese plated with seasoned crostini and C3PO cheddar crackers. Along with great food the Rebel Hangar Lounge also serves themed adult beverages. I would highly recommend The Tatooine Sunset and The Rebel Red. 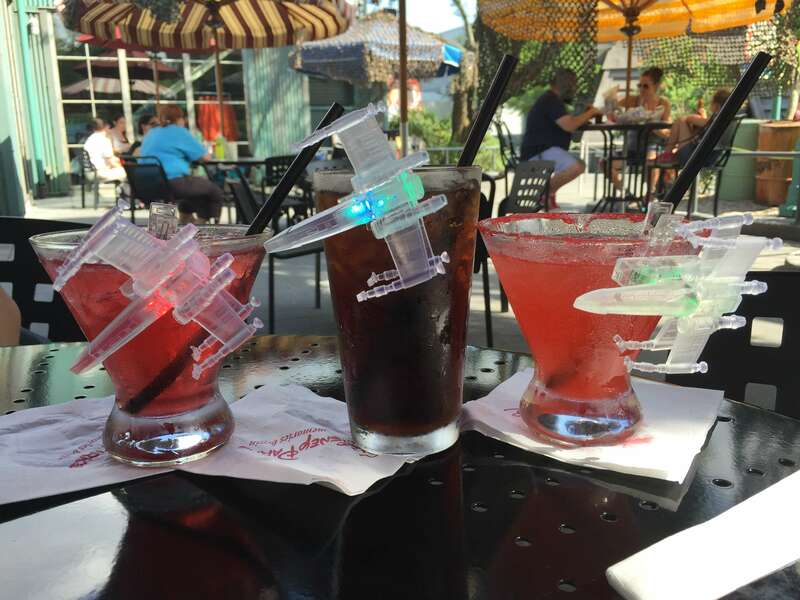 Each drink is adorned with a glowing X-wing that is exclusive to the Rebel Hangar Lounge and yours to take home with you. The Tatooine Sunset combines the sweet flavors of pineapple and coconut while The Rebel Red offers a more fierce taste of sweet-and-sour with grenadine. The Rebel Red, on the left and The Tatooine Sunset, on the right, were a refreshing treat. Although the Rebel Hangar Lounge is not listed as a character dining experience there is plenty of members who serve the Rebel Alliance stopping at the Hangar to refuel. I had the opportunity to meet Ezra and Sabine as they were passing through looking for bucket heads, a member of the Figrin D’an and the Modal Nodes shared stories at our table and I even got to make a trade with a Jawa. Don’t forget to bring your space junk with you, the Jawas are always looking for a trade. A member of the Figrin D’an and the Modal Nodes band stopped by our table. We rounded out this amazing experience with dessert that was out of this galaxy! The Rebel Hanger Lounge offers two dessert options. 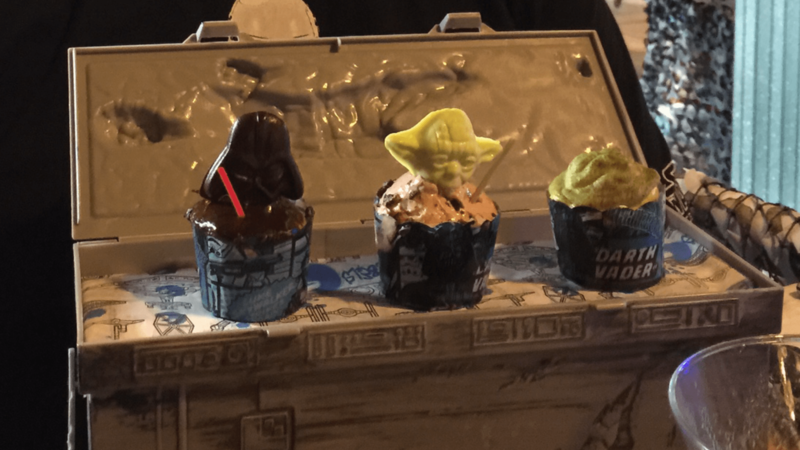 A Yoda inspired key lime cake and a trio of Star Wars mini cupcakes that comes in a Han Solo frozen in carbonate keep sake bucket. The cupcake trio offered a cupcake that is guaranteed to please every space traveler. As we head into the last weekend of Disney’s Star Wars Weekends, be sure to add the Rebel Hangar Lounge on your list of things to see. The restaurant is open 7 days a week from 4:00pm to park close. You can call Disney Dining to make a reservation. My name is Becky Kozak and I am the newest writer for Orlando Fun and Food. By day I am event coordinator for a local non-profit and by night I am buzzing around town visiting the theme parks and exploring new restaurants. I am looking forward to being able to share all the new and exciting things Orlando has to offer with you! Can't wait to meet all of you! Next Post Summer Fun With Sun-N-Fun Resort!